Commute bicycles often come equipped with a generator and lights. The best generator is the one that is inside the hub of the front wheel, as is available on one of the Breezer models, and on the Specialized Globe. 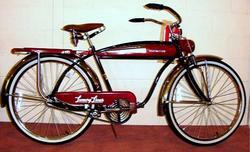 There are also some retro cruiser type bicycles which come with useless battery powered lights. You can see a selection of commute bicycles at http://commutebikes.com (one of my sites). Breezer Uptown has a Shimano front hub dynamo with front and rear lights. Specialized Globe has a Shimano front hub dynamo with front and rear lights. Roadmaster Luxury Liner reproduction has a built-in battery powered light, but it's just a toy-like light.